Noise, vibration, and harshness, also known as NVH, refers to the comprehensive engineering of noise and vibration of a device through stages of their production, transmission, and human perception. NVH is a primary concern in car and home appliance industries because many consumers take into account the quality of noise when making buying decisions. For example, a car that sounds too quiet (unsafe) or too loud (uncomfortable) is a definite turnoff. That said, a smartphone may strike you as an acoustically innocuous device (unless you are not a big fan of Metallica ringtones), for which the application of NVH seems unwarranted. After all, who would expect the roar of a Harley from a smartphone? But think again. Albeit small in amplitude (less than 30 dB), smartphones emit an audible buzz that, because of the close proximity to the ear, can degrade the call quality and cause annoyance. The major culprit for the smartphone noise is the collective vibration of tiny electronics components, known as multi-layered ceramic capacitors (MLCCs). An MLCC is basically a condenser made of piezoelectric ceramics, which expands and contracts upon the application of voltage (hence piezoelectric). A typical smartphone has a few hundred MLCCs soldered to the circuit board inside. The almost simultaneous pulsations of these MLCCs are transmitted to and amplified by the circuit board, the vibration of which eventually produces the distinct buzzing noise as shown in Fig. 1. (Imagine a couple hundred rambunctious little kids jumping up and down on a floor almost in unison!) The problem has been even more exacerbated by the recent trend in which the name of the game is “The slimmer the better”; because a slimmer circuit board is much easier to flex it transmits and produces more vibration and noise. Recently, Yonsei University and Samsung Electromechanics in South Korea joined forces to address this problem. 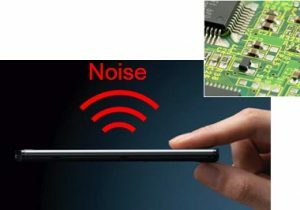 Their comprehensive NVH regime includes the visualization of smartphone noise and vibration (transmission), the identification and replacement of the most problematic MLCCs (production), and the evaluation of harshness of the smartphone noise (human perception). For visualization of smartphone noise, a technique known as the nearfield acoustic holography is used to produce a sound map as shown in Fig. 2, in which the spatial distribution of sound pressure, acoustic intensity or surface velocity can be overlapped on the snapshot of the smartphone. Such sound maps help smartphone designers draw a detailed mental picture of what is going on acoustically and proceed to rectify the problem by identifying the groups of MLCCs most responsible for producing the vibration of the circuit board. Then, engineers can take corrective actions by replacing the (cheap) problematic MLCCs with (expensive) low-vibration MLCCs. Lastly, the outcome of the noise/vibration engineering is measured not only in terms of physical attributes such as sound pressure level, but also in their psychological correlates such as loudness and the overall psychoacoustic annoyance. This three-pronged strategy (addressing production, transmission, and human perception) is proven to be highly effective, and currently Samsung Electromechanics is offering the NVH service to a number of major smartphone vendors around the world. of Horse Racing, a Mongolian folk song, would sound on a modern violin? 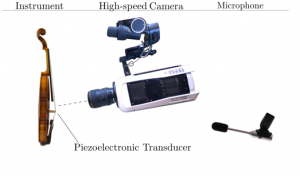 Our work is concerned with the research of acoustic similarities and differences of these two instruments using high-speed camera measurements and piezoelectric pickups to record and quantify the motion and vibrational response of each instrument part individually. The research question here is, where do acoustic differences between both instruments begin and what are the underlying physical mechanisms responsible? The Chinese erhu is the most popular instrument in the bowed string instrument group known as huqin in China. It plays a central role in various kinds of classical music as well as in regional folk music styles. Figure 1 shows a handcrafted master luthier erhu. In orchestral and ensemble music its role is comparable to the European violin as it often takes the role as the lead voice instrument. Figure 1. A handcrafted master luthier erhu. This instrument is used in all of our measurements. In contrast to the violin, the erhu is played in anupright position, resting on the left thigh of the musician. It consists of two strings, as compared to four in the case of the violin. The bow is put between both strings instead of being played from the top as European bowed instruments are usually played. In addition to the difference in bowing technique, the left hand does not stop the strings on a neck but presses the firmly taut strings, thereby changing their freely vibrating length. A similarity between both instruments is the use of a horse-hair strung bow to excite the strings. The history of an instrument similar to the erhu is documented from the 11th century onwards, in the case of the violin from the 15th century. The historic development before that time is still not fully known, but there is some consensus between most researchers that bowed lutes have their origin in central Asia, presumably somewhere along the silk road. Early pictorial sources point to a place of origin in an area known as Transoxiana which spanned an area across modern Uzbekistan and Turkmenistan. Comparing instruments from different cultural spheres and having different backgrounds is a many-faceted problem as there are historical, cultural, structural and musical factors playing an important role in the aesthetic perception of an instrument. Measuring and comparing acoustical features of instruments can be used to objectify this endeavour, at least to a certain degree. Therefore, the method applied in this paper aims at finding and comparing differences and similarities on an acoustical level, using different data acquisition methods. The measurement setup is depicted in Figure 2. Figure 2. Measurement setup for both instrument measurements. The vibration of the strings are recorded using a high-speed camera which is able to capture the deflection of bowed strings with a very high frame rate. An exemplary video of such a measurement is shown in Video 1. Video 1. A high-speed recording of a bowed violin string. The recorded motion of a string can now be tracked with sub-pixel accuracy using a tracking software that traces the trajectory of a defined point on the string. The motion of the bridge is measured by applying a miniature piezoelectric transducer, which converts microscopic motions into measurable electronic signals, to the bridge. We record the radiated instrument sound using a standard measurement microphone which is positioned one meter from the instrument’s main radiating part. This measurement setup results in three different types of data: first only the bowed string without the influence of the body of the instrument; the motion of the bridge and the string; and a recording of the radiated instrument sound under normal playing conditions. Returning to the initial question, we can now analyze and compare each measurement individually. What is even more exciting, we can combine measurements of the string deflection of one instrument with the response of the other instrument’s body. In this way we can approximate the amount of influence the body has on the sound colour of the instrument and if it is possible to make an erhu performance sound like a violin performance, or vice versa. The following sound files convey an idea of this methodology by combining the string motion of part of an Mongolian folk song played on an erhu with the body of an European violin. Sound-example 1 is a microphone recording of the erhu piece and sound-example 2 is the same recording using only the string measurement combined with an European violin body. To experience the difference clearly, headphones or reasonably good loudspeakers are recommended. Audio File 1. A section of an erhusolo piece recorded with a microphone. The results clearly show that the violin body has a noticeable influence on the timbre, or quality, of the piece when compared to the microphone recording of the erhu. But even so, due to the specific tonal quality of the piece itself, it does not sound like a composition from an European tradition. This means that stylistic and expressive idiosyncrasies are easily recognizable and influence the perceived aesthetic of an instrument. The proposed technique could be used to extend the comparison of other instruments, such as plucked lutes like the guitar and pi’pa, or mandolin and ruanxian.